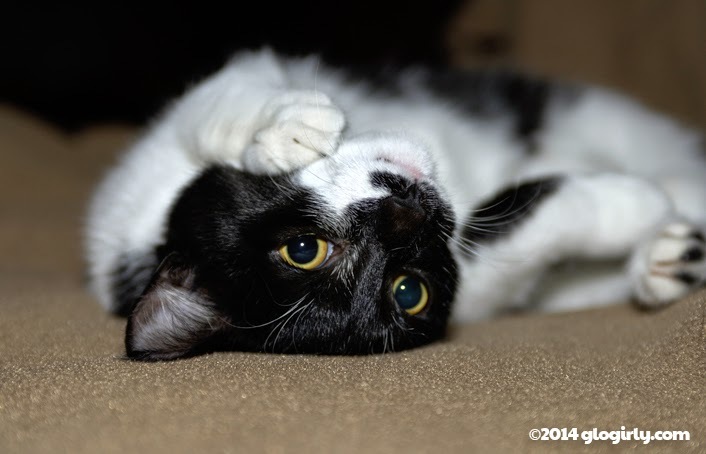 KATIE: It may be Kitten Flashback Friday, but I still use my patented *upside-down-tilt-head-touch-cheek-with-paw* look every single day with Gloman. Each morning when he's getting getting ready for work, I wait for him in the closet. He shuts the door (and shuts out Waffles) so that it's just the two of us. I roll on the floor just like this and he's putty in my paws. It's the most special time of the day. For SO many reasons. WAFFLES: Hey Boss!!! 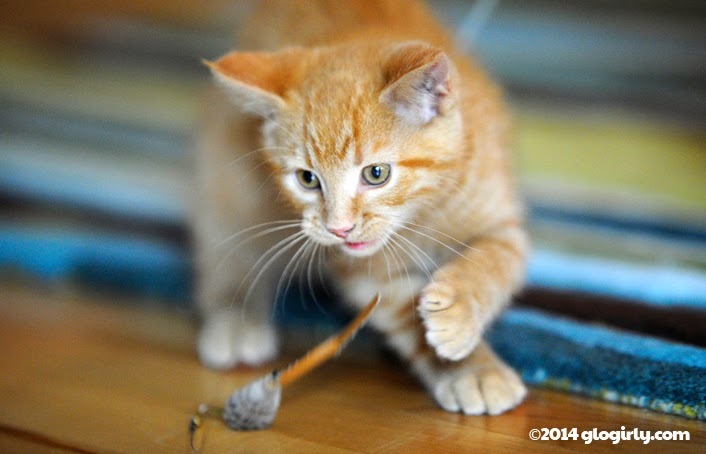 I'm flashing back Friday too with your mouse catcher wand toy! KATIE: You mean my former mouse catcher wand toy. Before you chewed his tail off. WAFFLES: And his eyes too. WAFFLES: Here's another one to flash back. Remember this? KATIE: How could I forget? 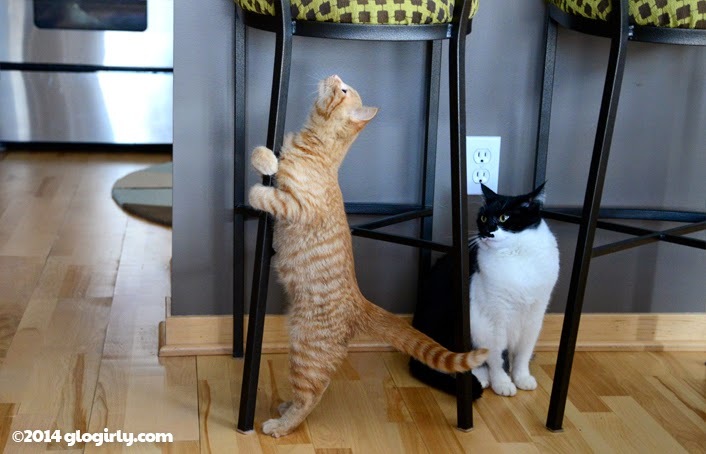 WAFFLES: I was still a kitten but I was taller than even YOU! KATIE: And it was at that point I realized the days of you being smaller than me were numbered. A very small number. Okay ... Katie, I have to say that while Waffles gets more "awww ... that's cute" moments vs. your more distinguished poise ... you sure got the orange guy beat when you turn it on, girlfriend! Love the cute moments! Have a good weekend! Awww Katie, it's easy to see why Gloman is smitten with you. That special look you give him is so precious that no one could resist your charms. Aw, Katie. I bet sometimes you wish you could go back to those days where Waffles was smaller than you. Those are some mighty fun flashback, Katie and Waffles. We hope you, Glogirly and Gloman are all doing well. Hugs! Daddies are so easy to wrap around little paws..